EMI Network takes great pleasure in celebrating the successes of other entrepreneurs. Please enjoy our series of Business Leader profiles. Arlette and Matthew Woods’ journey to entrepreneurism had an improbable beginning: a dog nose. After boarding their beloved chocolate Lab, Geisha, for a week, the Woodses returned home to find Geisha with a raw patch on the end of her nose. They learned that during their trip, their energetic puppy had been crated for five to six hours during the day, and her separation anxiety caused her to rub her nose against the grate in an attempt to get out and find companionship. The Woodses were heartsick. The Woodses came to learn about a chain of dog day and overnight camps, Camp Bow Wow. After taking Geisha to the location in Elk Grove, Calif., they fell in love with the concept. From there, two entrepreneurs were born. Eight years later, the Woodses have left behind their previous careers and now own Camp Bow Wow franchises in Elk Grove and Livermore. Parents to two human children and two canine kids, Matthew and Arlette are extremely busy and extremely fulfilled. 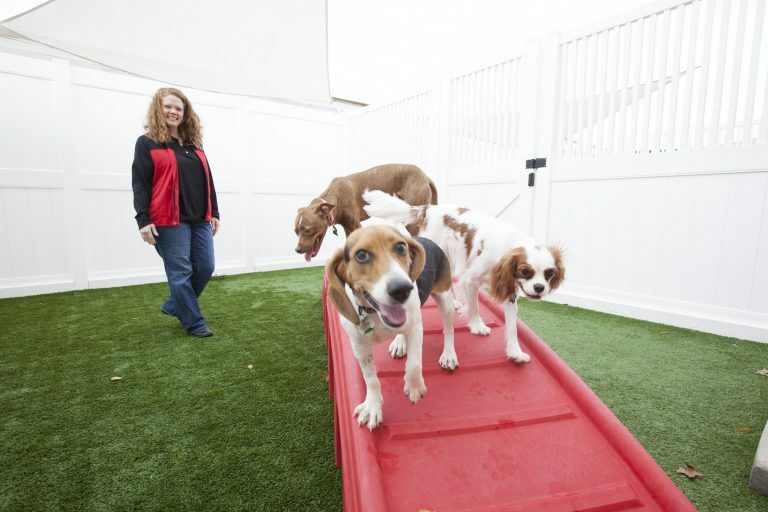 Camp Bow Wow’s concept is one of all-day play, “where a dog can be a dog.” That’s what drew in the Woodses and sparked their initial conversation about becoming franchise owners. At the time, Arlette worked for a bank. Her sister is a veterinarian, and as a child, Arlette had spent a lot of time around animals. Matthew was a maintenance supervisor for an airline, overseeing 150 employees working on as many as 30 aircraft on a given night. They believed that with their combined experience, and the support of the corporate franchise, they could run a successful business. When they first filed paperwork with Camp Bow Wow, Arlette was pregnant with the Woodses’ first child, Madeline. They were taking a huge leap, but the risk has been worth it. “It is an investment, but corporate has always been there for us in guiding us through the process,” Arlette says. “They understand what works better for each person in each city—the size of each camp. And the pet industry is growing. If you do a good job and are good to your clients and to the dogs and to your staff, there’s no reason why that shouldn’t continue. The Woodses agree that the support of their franchise community sparked their success and inspired confidence. That confidence spurred them to purchase the Elk Grove location when it became available about three years ago. They’ve grown into their roles as business owners, each emphasizing his or her specific strengths. Arlette handles administrative duties; Matthew focuses more on managing employees. They’ve developed systems for keeping a professional relationship at work and separating that from their life as a couple at home. They bring both their dogs, Geisha and Kysen, to camp each day, and children Madeline, now 8, and Michael, 4, are happy to be part of the thriving family business. Though the work days can be long, Arlette says, the Woodses have a flexibility they lacked in the corporate world. That makes managing family and business not only doable, but enjoyable. Arlette and Matthew credit Geisha with helping them live their dream come true—a dream they didn’t even know they had when they first met. For her part, Geisha is “a celebrity” around camp. She helps with behavior assessments on new campers and greets dogs and their parents each day. She’s come a long way from that sad puppy with the sore nose. And she’s brought her parents along for the ride of their lives. Our 100-plus Camp Bow Wow franchises host more than 3 million dog visits per year across the nation, and there are lots of available locations.